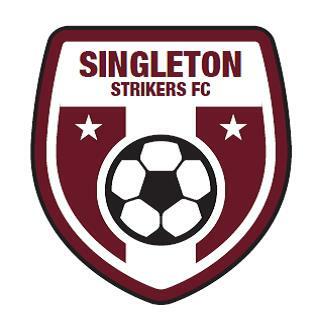 The Singleton Strikers flexed their muscles over local rivals Muswellbrook in their FFA Cup Round 1 fixture last Sunday, when they ran up a record breaking 12 – 0 scoreline. Muswellbrook, 2 divisions below the Strikers, thought they were in with a chance of an upset with Singleton’s top 2 goal scorers from 2014 Lloyd Wakewood and Klaudon Ahmataj sitting on the sidelines injured, but the new look Strikers line up proved far too slick for the Muswellbrook defenders. Singleton started well and dominated the early exchanges but it took 20 minutes to break the deadlock when Dan Bartlett forced the ball over the line from close range. But then the flood gates opened and Singleton piled on 6 more goals in the 25 minutes up to half time. Dan Bartlett was proving unstoppable and scored 5 first half goals. He was ably assisted by Ryan Hartwell and James Bates who also got their names on the score sheet to bring up the half time score of 7-0. The progression continued into the second half. Bartlett added his 6th goal of the day before being given a well earned early mark by stand-in coach Warren Gillespie. Ryan Hartwell took up the goal scoring challenge and added 2 more goals to score a very impressive hat trick. Further goals to UK defender Jordan Phelan and new signing Stephen Bramley finished off the scoring at 12- 0 …….an emphatic win for the Strikers. In a stand out team display, it is hard to single out individuals but Dan Bartlett’s 6 goals were a fair indication of the headaches he caused Muswellbrook. And the form of the midfield trio of Stephen Bramley, Ryan Hartwell and skipper Jackson Cox was also impressive. Round 2 of the FFA Cup sees a sterner test for the Strikers next weekend when they take on fellow First Division team West Wallsend.